How do you improve sales performance? I’ve read a lot of sales studies in my time and most of them state the obvious (“sales leaders are worried about a downturn in the global economy” … no kidding? Me too) or raise questions that only an expensive consultant will tell you the answer to. 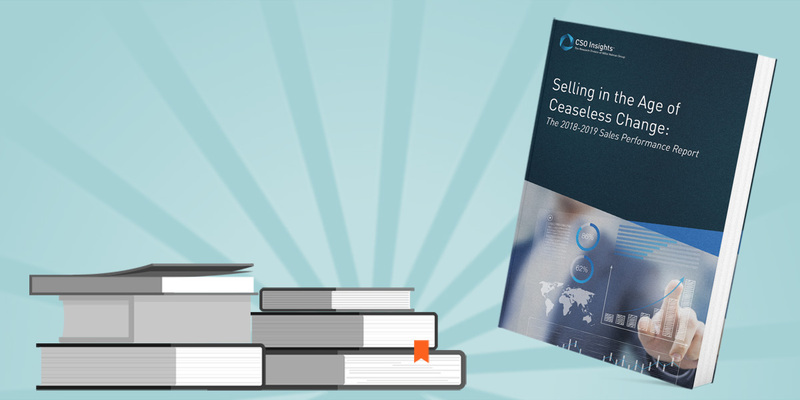 However, the CSO Insights 2019 Sales Performance Report: Selling in the Age of Ceaseless Change is different. Not only does it reveal the challenges organisations face to attract and retain customers in 21st century, it explains how to actually improve sales performance. Around 900 global sales leaders were surveyed to identify their objectives guiding sales performance improvement efforts in 2019. Expanding penetration into existing customers. How sales performance compares to previous years. What successful companies are doing to improve sales performance. Grab the full report for some truly revealing insights and actionable advice. However if you’re so excited you can’t wait and want the highlights now, read on. Sales still generate the most leads. However alignment with marketing on lead definition is getting worse. So how do you get prospecting right? Connect your sales process to your customers’ process. Define how success will be measured. Create a dashboard that reports a combination of leading indicators, like conversion rates per lead stage, and lagging indicators such as revenue contribution. This will increase visibility and awareness of lead generation effectiveness. Define a lead is versus an inquiry. Qualify leads by developing a scoring model that reflects your industry and the complexity of your customers’ buying process. 57% said new business is their priority despite only 29.9% of total revenue was from new customers. How do you improve acquisition of new accounts? Identify all the strategies and tactics you and your customers use to move through the sales process. Map into your CRM and gather data to optimise your process. Opportunity planning should be a process, not an event. Plan the work and then work the plan. (For more grab your copy of my capture planning eBook with one click). Experiment with AI. Use extra dimensions to segment customers and analyse key factors that influence the likelihood they’ll buy. 70.1% of revenue comes from existing customers. However only 34.6% of respondents have confidence in their ability to grow accounts. How do you fix this? Align service resources with sales resources into teams responsible for customer satisfaction and retention. For instance, customer experience and customer success teams. Account planning isn’t just how to identify and close additional opportunities. It must also help the client solve business problems in a way that increases loyalty. Explore new technologies to improve effectiveness and efficiency. Intelligent tools provide shortcuts for account planning, research and analysis and may even automate the renewal process. The average win rate is 47.3%. However if you’re considered a trusted partner, it jumps to 59.9%. How do you earn trust? Customer Advisory Boards are best for honest feedback on the good, bad and ugly of what it’s like to do business with you and use your solutions. (If you want help on Customer Advisory Boards, let me know. I’ve created a project plan you might find useful). Use content management systems to share the right content based on analysis of the clients’ challenges. Guide sales teams with insights and perspectives to share at each phase of the sales cycle. What if you could start over? What would sales leaders do differently if they had to start again? Overwhelmingly they picked talent as the one thing they would change. However, only 16.4% felt that their teams had the talent needed to be successful in the future. You need to close the skills gap, for both you and your team. NOW. Where do you excel, where do you struggle? Make a plan and invest in relevant training. In addition, they would structure sales teams differently and organise by vertical to allow teams to target industry knowledge and better engage prospects and customers. Changing the sales methodology or approach to selling. Better aligning sales with other parts of the organisation. Aligning more tightly to the customer. Using different technologies or use existing technologies differently. In other words, expand the vision of what is possible. Start there and you will have a stellar sales year in 2019. What do you think about this report? What challenges are you facing now? Do you think these solutions might work for you? Let me know in the comments. If you’d like to chat about any of these topics and how I can help you improve sales performance – book a discovery call with me.